Junior group coaching sessions are run throughout the week for all ages and abilities, led by our professional Head Coach, James Middleton, who is qualified to LTA Senior Performance Coach level. Having started his professional coaching career at 18, James has now coached in the UK, Abu Dhabi, Dubai and The USA. He has gained great experience working with players of many nationalities and all levels from beginners to Division One Collegiate Players and Professionals. James has worked with National Level Juniors in three countries, some of which have progressed on to play professional tennis. He has also Captained County Teams for both Nottinghamshire and Derbyshire. 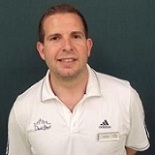 James managed an Indoor Tennis Centre in Solihull for nearly 4 years, where he was responsible for the entire tennis programme as well as the training and development of the tennis coaching team. As a player James competed on the British Tour and played qualifying events for professional tournaments, he also represented Nottinghamshire at both junior and senior level. James is friendly and approachable, and will be more than happy to discuss the coaching programme or individual lessons with you at anytime. With a track record in producing tennis players, James can help anyone maximise their potential, whatever their level. For details of our junior coaching sessions please visit the JUNIORS page. Interested in ADULT BEGINNERS coaching? Visit our Adult Coaching page.